They found Mary and Joseph and the infant. When the eight days were completed, he was named Jesus. The shepherds went in haste to Bethlehem and found Mary and Joseph, and the infant lying in the manger. When they saw this, they made known the message that had been told them about this child. All who heard it were amazed by what had been told them by the shepherds. And Mary kept all these things, reflecting on them in her heart. Then the shepherds returned, glorifying and praising God for all they had heard and seen, just as it had been told to them. When eight days were completed for his circumcision, he was named Jesus, the name given him by the angel before he was conceived in the womb. 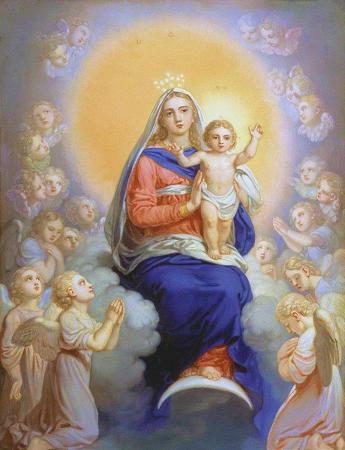 As Mother of God and mother of all God’s children, she is exalted above all creatures on the throne of glory; maternity itself is glorified through her. As Virgin, she manifests an incomparable beauty pleasing to God, along with the fruitfulness of virginal purity. As Queen, she evidences the conquering power of a serving love and of purity intact. Every woman who wants to fulfill her destiny must look to Mary as the ideal. (In Honor of Mary, Mother of God). the infinite God whom no space can contain. the priceless cross is venerated throughout the universe. Through you the fallen human race is admitted to heaven. and in the shadow of death. Amen.